I have been baking a lot of bread over these past few years when I was not posting much so I have a backlog of bread recipes to post. 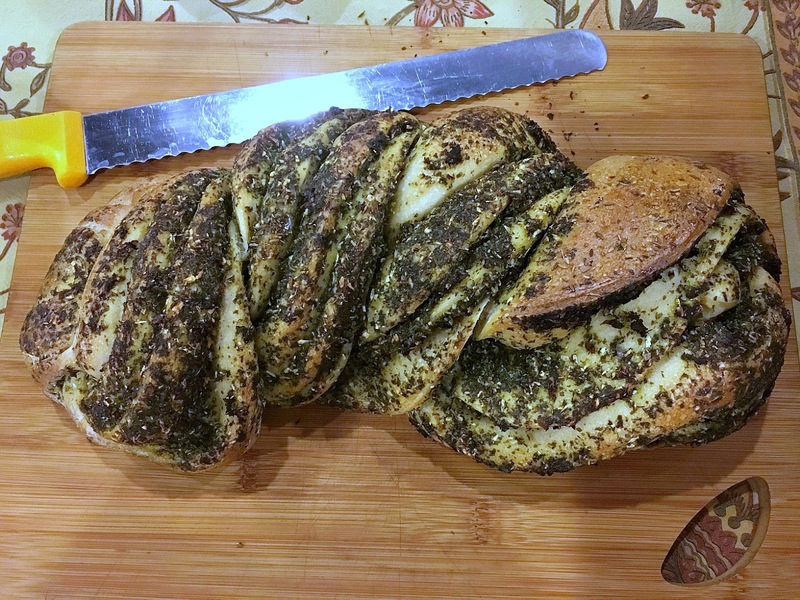 I usually make my go-to Fennel Seed Bread for my own use as it is quick and easy and I can mix it up pretty much in my sleep. But a couple of times a month I will take advantage of my spice group potluck dinner or my monthly bread group meeting to try something new. One of the things I love about my spice group is that it encourages me to use different herbs and spices in my breads. When the theme for one of our potlucks was mint I thought I went searching online and found this recipe. I had made the Cilantro Mint Chutney for a previous potluck and I was eager to tr to incorporate it into a bread. It came out better than I expected, especially considering the mistake I made of adding all of the liquid called for in the original chutney recipe. I could tell as soon as I started to spread it over the dough that it was far too wet, even after I wiped as much excess off as I could with a paper towel. As a result, the cut strips were slippery and hard to handle, which is why my bread looks so different than the one in the recipe. But it tasted great and disappeared quickly. So I adapted the chutney recipe to make it less wet and more spreadable on the raw dough. It is show-stopping bread and not all that difficult to make. Of course I adapted it from a commercial yeast bread to a naturally leavened one using Clotilde from Chocolate &Zucchini's method (found here). Add water to starter and mix. Add about 120g of the flour, then add the sugar and oil and mix well. Add the remaining flour, half a cup at a time, until a soft dough forms. Turn the dough out onto a lightly floured surface and knead until the dough is elastic, about 10 minutes. Form the dough into a ball and put it in a greased bowl, turning it over to make sure the top is greased. Cover and let rise for about an hour or until doubled in size. While the dough is rising prepare the mint chutney. Combine all of the ingredients in a blender or food processor and process until smooth. Do not add any more liquid or it will be too wet for the bread. Once the dough has doubled, punch it down and turn it onto a clean surface, adding flour if necessary. Roll the dough into a 10 x 14-inch rectangle. Spread the mint chutney mixture evenly over the surface of the bread, leaving about an inch free on the short sides of the rectanble. Roll it tightly lengthwise, sealing the edges and placing the seamed edge on the bottom. Starting about an inch down, cut a slit down the middle of the roll. Keeping the cut sides up, gently twist the two halves of dough together one on top of the other as tightly as possible, forming the dough. Pinch the ends together and transfer the dough to a baking sheet lined with parchment paper. Cover loosely with plastic wrap and let rise for about 2 hours, until almost doubled in size. After about an hour and a half, preheat the oven to 375° F. When the dough has finished rising, gently brush the top with egg wash, being careful to not drag the chutney onto the rest of the bread. Bake for 30 minutes, then rotate and bake for another 10 to 20 minutes, until the loaf is a dark golden brown on the top. Remove from the oven and let cool completely.